This 1930s original vintage important six arms chandelier made of gilt and burnished brass with white lacquered details is attributable to the designer Gio Ponti and the architect Emilio Lancia. Two of the most famous figures of Italian design and architecture during Art Deco and Mid-Century Modern period. The close collaboration between Gio Ponti and Emilio Lancia led to the realization of some fantastic projects in the new style called "Novecento" (Nine hundred), which was linked to the neoclassical tradition. This elegant and exquisitely rendered chandelier is made of brass and lacquer metal with a refined and purified tiered foliate decor. This light fixture pendant features six serpentine arms shaped as stylized horns or cornucopia tapering to fine curved points, and floret-shaped bobeches and finals anchored by a series of sleek disks and eggs. The chandelier's geometric and foliate elements, pared down to their essence, counterbalance each other to create a design of great lightness and presence, a beautiful example of Ponti's effortless marriage of modern and traditional tropes. Six cone-shaped lampshades included. Excellent structural conditions, minor wear and signs of oxidation throughout due to age and use. We can provide professional brass polish with a mirror-polished gilt effect on request for an additional price of € 700. The chandelier has an old still working electrification, however we recommend to rewire it. Measures: Height 83 cm, diameter 36 cm. Excellent structural conditions, minor wear and signs of oxidation throughout due to age and use. Professional brass polish with a mirror-polished gilt effect for only &euro; 700 on request, please ask for this additional service before checkout payment. 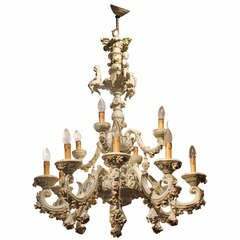 Cast bronze chandelier by Emilio Lancia, circa 1930 Elegant bronze metalwork with red shades. Chandelier with sober and elegant shapes. An authentic jewel out of the Murano furnaces. Brass chandelier Murano pair of glass shades.